This column was originally published in the Central Western Daily on Tuesday 15 July 2014. In comic book fandom, there is only one true living legend. Spider-Man, Thor, Iron Man, the Hulk, the Fantastic Four and the X-Men are just a few of the co-creations of Stan “The Man” Lee. 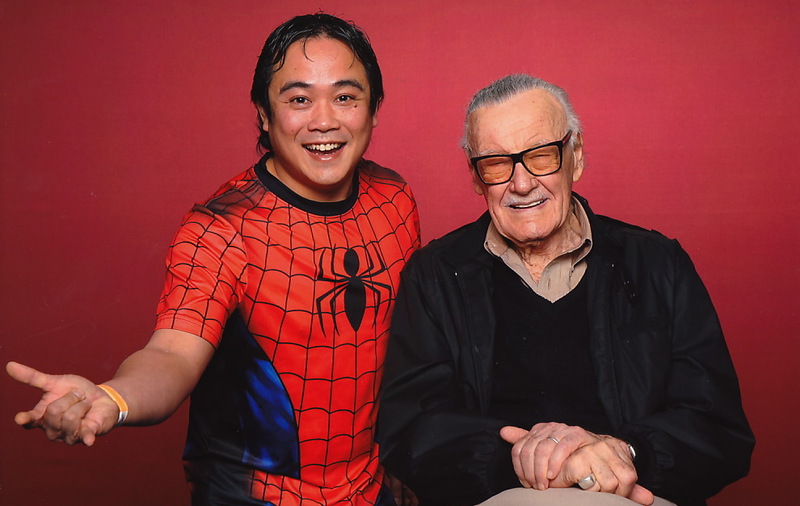 At the spritely age of ninety one, Lee was recently on our shores for his farewell world tour, and I was one of 50,800 fans who attended the Supanova Pop Culture Expo just to be in the same room as the creator of the Marvel Universe. I actually did a little better than that, also having the opportunity to have a photo with and obtain an autograph from “Smilin'” Stan Lee. As the Game of Thrones travelling exhibition proved (I came, I saw the queue, I went home), being a lover of pop culture often means enduring long waits, and Supanova was no exception. Even with my reasonably expensive “True Believer” pass, I was still subject to queues which snaked across the immense concrete floor of what is normally the food pavilion of the Royal Easter Show. It was impossible to get lost. There was a plethora of kooky volunteers to prod you into a single file, and the seemingly never ending masking tape arrows at your feet would see you to the superstar guest of you choice, eventually. I was quite amazed at the efficiency of the celebrity photography outfit at Supanova. It was literally get in, drop your bags, get drenched, er, I mean smile, get out and collect your glossy photo. Proudly sporting my new lycra Spidey tee, I approached Mr Lee who was comfortably seated on a bar stool. I posed, we smiled, there was a flash and a treasured memento for my living room was made. I was quite chuffed when Stan muttered, “Good work.” Hey, who is going to turn down positive feedback from the revered co-creator of Doctor Strange? The autograph process was much the same. Luckily for me, my pass allowed me to bypass the extremely lengthy general admission queue and join the “True Believer” queue. Sigh. Standing in line at a pop culture convention is never boring. There are always interesting geeks, who know more about Doctor Who than should be legal, to converse with, as well as costumed cosplayers to admire (or not as the case may be – portly Picard I’m talking about you). At the head of the line, I hastily unfurled my limited edition print (Stan fighting off a Mars Attacks alien with a typewriter) and was waved on to meet “The Man” again. Seconds later I was on my way with an authentic Stan Lee signature (I paid extra for a sticker that says so) and a brief story about how the typewriter on the poster is a depiction of the original typewriter that he used until his ex-wife broke it, and that was why she was his ex-wife. I assume that was a joke. The highlight of my day was a filled to capacity Q & A session where Lee bounced around the stage, captivating the audience with tales of Marvel’s early years, the origins of now iconic super heroes and his favourite creation (for the record, it is Spider-Man). I just hope that when I am ninety one, I will still have such passion for my work. Forget that, I hope that I still have a passion for anything. I also hope that thousands of geeks will pay hundreds of dollars to get my autograph and have photos with me, as I relax in a chair. Excelsior!! This column was originally published in the Central Western Daily on Tuesday 30th July 2013. I’ve always loved comics. As a kid, I’d arrive at the bus stop early and browse the comic racks at the newsagency. Each week I’d receive my allowance and put aside just enough money to purchase a comic, which I would read on my way to school and reread on the return journey. I would then file the comic safely away in a shoebox where I presumed it would stay for years under my bed until it became valuable. What I didn’t know at the time was that the price the newsagent scribbled on the front cover in black marker rendered the comic worthless then and forever. A couple of years ago, I found myself in a financial position (pre-mortgage, of course) that allowed me to have the latest comics delivered weekly from a specialist store in Sydney. Every Friday, I’d receive a package of crisp, mint condition books. I’d carefully read them before they were sealed inside acid free bags and then transferred to a comic storage box where I presumed they would stay for years in my spare room until they became valuable. What I didn’t know at the time was that there are thousands and thousands of nerds around the world doing exactly the same thing and that the vast majority of comics decrease in value over time. Only limited condition covers and pristine first editions are worth collecting. Several thousands of dollars later, I realised that what I actually enjoyed was following the adventures of Batman, Superman and other superheroes with their underwear on the outside, not the actual physical act of collecting comics. And that’s why I’m now hooked on the Comics iPad app by Comixology. Comixology is a platform for purchasing, reading and collecting digital comics. Both DC and Marvel sell digital editions of their printed products, as well as digital exclusive titles, through Comixology. Many major independent publishers also participate. Once you buy a comic, it stays in your virtual collection forever and is accessible via multiple devices (smartphone, tablet and PC). Actually, similar to music collections on iTunes, you are only licensing the comics for your own personal use until you die. You can’t bequeath your comic collection to anyone else. One of the great features of the Comixology platform is the patent pending “guided view” technology, which allows the reader to follow the action panel by panel, replicating the normal action of the eye when reading a printed comic page. Both golden age and brand new comics look great in HD. At the moment I am thoroughly enjoying The X-Files Season 10, which sees Mulder and Scully continuing to search for the truth following the events of the final episode of the TV series. I’m also keen on the ongoing adventures of the new movie universe USS Enterprise crew in Star Trek. The Walking Dead remains a perennial favourite. I’ve also just discovered Batman ’66 which continues the campy trials and tribulations of the Adam West caped crusader universe. Holy priceless collection of Etruscan snoods! Newspaper Comic Strips: are you a three panel addict? This column was originally published in the Central Western Daily on Tuesday 12th July 2011. Turn to the comics page of this paper. Go on, I can wait. Check out the Garfield strip for today. Did you notice today’s date, in American format, on the side of one of the panels? That’s right. That is today’s Garfield strip for the planet. Every paper worldwide that carries Garfield has exactly the same strip today. That’s pretty amazing. There wouldn’t be a story, let alone a reporter, writer or columnist with that level of coverage around the globe. It’s a good thing that Garfield has no political or religious agenda, unless you’re for the rights of lasagne. Garfield is carried in over 2500 publications and holds the Guinness World Record for the most published syndicated strip. Created by Jim Davis in 1978, the strip had humble beginnings, initially being published in 41 newspapers. Three years later, it was being carried by 850 publications. It is estimated that Garfield now brings in up to a billion dollars of revenue a year in sales. Not bad for a lazy cat. Imagine how difficult it must be to come up with something witty and different every single day of the year. After over thirty years of writing, how would you know if you had used the same scenario before? Would anyone care or even notice? Do you write a single strip a day, or do you produce months of content in one big creative spurt and then have some time off? My mind boggles. Not surprisingly, Jim Davis is no longer the principal artist on Garfield although amazingly, he still authors the storylines and text. I assume he needs the extra time to count his money. That’s what I’d be doing. My favourite Garfield strips are the ones without Garfield. In 2008, Dan Walsh created a website, Garfield Minus Garfield, where he digitally removed Garfield and all of the other characters, leaving Jim to speak to himself. The end result is a different but hilarious spin to the franchise, with Jim’s solo mutterings, reactions and twitches being laugh out loud funny and a little disturbing at the same time. In 2008, an officially endorsed Garfield Minus Garfield book was published. It is on my Christmas wish list. I quite like The Phantom too. Unlike most humour-based strips, the adventures of The Ghost Who Walks are told in long arcs which are split into daily strips. The story is slowly revealed in a few panels per day. The funny thing about The Phantom is that you never know where you are in the storyline. Without the context of what has happened before, the daily strip usually makes no sense. Most days, the Guardian of the Eastern Dark punches someone in the first panel, we see the mark left by his skull ring on the villain’s face in the second, and he rides off on his horse, Hero, in the third. Compelling stuff, isn’t it? Of course, with the short term memory of a goldfish, I can never remember what happened in yesterday’s instalment but that doesn’t stop me from dutifully reading The Phantom every day and loving it. I guess as long as The Man Who Cannot Die remembers what he did yesterday, the wheels of jungle justice will keep turning. So enjoy your comics page in today’s paper knowing that the same couple of seconds enjoyment you are getting is being shared by millions of people worldwide. This column was originally published in the Central Western Daily in Tuesday 27th July 2010. I’ve written previously about the disappointment of having your favourite television show axed with no storyline resolution, denying you the opportunity to say goodbye to much beloved characters. I’ve since discovered that several of my favourite shows live on, but this time they’re back in comic book form. Buffy the Vampire Slayer ran from 1997 to 2003. Starring Sarah Michelle Gellar and created by Joss Whedon of Firefly and Dollhouse fame, Buffy is still a fan favourite and continues to sell extremely well on DVD. The final season of Buffy, the seventh, culminates in an all-out battle between the Scooby Gang and the bad guys, known as the First Evil. Whilst delivering a satisfactory ending, many fans felt that there were still more stories to tell. In 2007, Dark Horse Comics began publishing Buffy the Vampire Slayer Season 8 in illustrated form. With writing from Joss Whedon, the comic picks up directly from where the television series left off. Initially proposed to be a 25 issue limited series, the comic proved to be so popular that it was expanded to 40 issues. With number 35 recently hitting the shelves, Season 9 in comic book form has now been announced. First edition copies of Season 8 issues have become highly collectible items, but for the non-collector, much of the series has been reissued in graphic novel format. Angel was a spin-off TV series from Buffy and starred David Boreanaz, who later went on to feature in hit crime procedural dramedy, Bones. Airing from 1999 to 2004, Angel ran in parallel with Buffy storyline-wise for its first three years, with multiple guest appearances from the titular cheerleader (and vice versa). Angel’s final episode ended with an ambiguous cliff hanger which frustrated many loyal fans. Angel: After the Fall began publication by IDW Comics in 2007. Buoyed by the success of Buffy Season 8, Angel’s comic incarnation also follows in a canonical extension of the live series. Running for 17 issues with Joss Whedon contributing to the writing, it has since evolved into an ongoing title. Similarly, the Aaron Spelling produced series Charmed is soon to continue on in comic form. Ceasing production in 2006 after 178 episodes, the comic adventures of the Halliwell sisters will take place following the events of the final and eighth season. It could be argued that the storylines of Charmed were already two dimensional prior to the comic but I wouldn’t want to offend the show’s whacky wicca fans. A comic afterlife is also planned for the much missed and prematurely cancelled Pushing Daisies. For those of you who can’t get enough of current hit shows, further comic book adventures in the worlds of True Blood, Eureka, Doctor Who and Supernatural have been released. Comic book continuations of television franchises are a great way for fans to follow the ongoing trials and tribulations of their favourite characters. Whilst television shows are slaves to production budgets, ratings and the contract lengths of its stars, comic books can keep both the studios and fans happy with storylines limited only by the writer’s imagination.